The Second Series contained 30 illustrations numbered 21 to 50, and appeared in Issue 4. 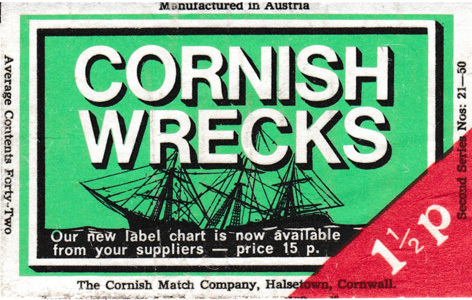 They were made by Solo Match Company of Austria and were issued between 1970 and 1973. 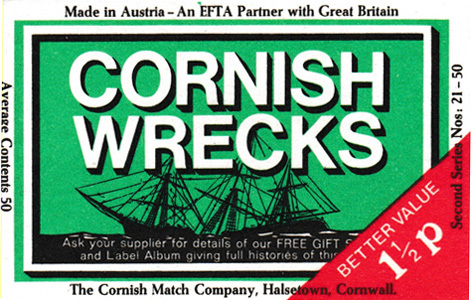 The Second Series appeared with six different average contents, as identified by the base label on the box. 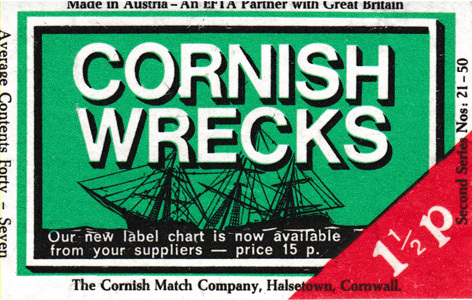 Click here for a list of all the Wreck labels. 21 Alexander Yeats 25th September 1896 Ship of Liverpool 1,476 tons net. 22 Andola 30th January 1895 Ship of Liverpool 1,955 tons net. 23 Balbec 28th March 1884 S.S. of Glasgow, 484 tons net. 24 Bay of Panama 10th March 1891 4-mast ship of London 2,282 tons net. 25 Busby 24th June 1894 S.S. of Stockton 2,107 tons net. 26 Cromdale 23rd May 1913 Ship of Aberdeen 1,849 tons net. 28 Gunvor 5th April 1912 Barque of Farsund, Norway. 1,491 tons net. 30 Ixia 30th June 1929 S.S. of North Shields. 1,828 tons net. 31 Khyber 15th March 1905 Ship of Liverpool. 1,927 tons net. 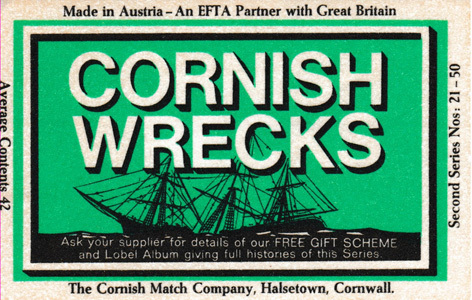 32 Lizzie R. Wilce 7th January 1908 Schooner of Falmouth. 132 tons net. 33 Lyminge 19th September 1931 S.S. of London. 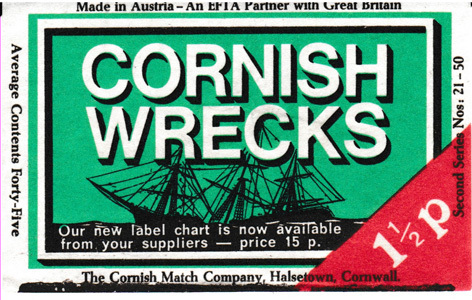 1,039 tons net. 34 Maipu 27th July 1879 Barque of Liverpool. 570 tons net. 35 Malta 15th October 1889 S.S. of Glasgow. 1,444 tons net. 36 Mosel 9th August 1882 S.S. of Brennen. 1,931 tons net. 37 Noisiel 3rd August 1905 Barque of Plymouth. 391 tons net. 38 Ocklinge 4th March 1932 S.S. of Cardiff. 1,258 tons net. 39 Pindos 10th February 1912 4m Barque of Hamburg. 2,351 tons net. 40 Queen Margaret 5th May 1913 4m Barque of Glasgow. 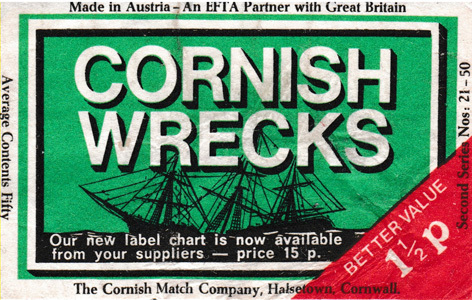 1,999 tons net. 41 Sainte Anne 3rd November 1931 Schooner of Paimpol. 136 tons net. 42 Seine 28th December 1900 Barque of Dunkirk. 1,587 tons net. 43 Socoa 1st August 1906 4m Ship of Bayonne. 1,826 tons net. 44 Suevic 17th March 1907 S.S. of Liverpool. 8,026 tons net. 45 Suffolk 28th September 1886 S.S. of London. 1,924 tons net. 46 Torbay Lass 8th December 1891 Schooner of Cardiff. 131 tons net. 47 Voorspoed 7th March 1901 Barquentine of Amsterdam. 272 tons net. 48 Wandsbeck 26th May 1900 Ship of Hamburg. 1,737 tons net. 49 Welcome Home 19th November 1905 Schooner of Plymouth. 88 tons net. 50 W M Cory 5th September 1910 S.S of London. 1,592 tons net.